Chef Stephanie Pearl Kimmel and the Marché Restaurant Group recently announced the plans for Provisions Market Hall, a one-of-a-kind food hall based in Eugene, Oregon. For more than 40 years, Kimmel and her team have brought the region’s best ingredients, wine, coffee, and more to the table. Her family of businesses—including the renowned Marché restaurant, casual cafés and the current version of Marché Provisions—have been at the heart of a food culture inspired by the distinctive bounty found in Oregon’s Willamette Valley. The team will now channel this knowledge and vision into the Provisions Market Hall, an extraordinary local food experience set to open this August. The Market Hall will represent an expansion and re-envisioning of Marché Provisions, Kimmel’s eight-year old food-lover’s paradise in Eugene’s historic 5th Street Public Market. New elements in the 10,000 square foot space will include a butcher shop, fishmonger, produce section, prepared foods, retail cookware and tabletop, eateries and a demonstration kitchen for classes and private events. Many of the beloved parts of the current Marché Provisions will be expanded and refreshed: the wine shop, hearth pizza oven, a cookbook area, gifts, the salad bar, the coffee shop and bakery. 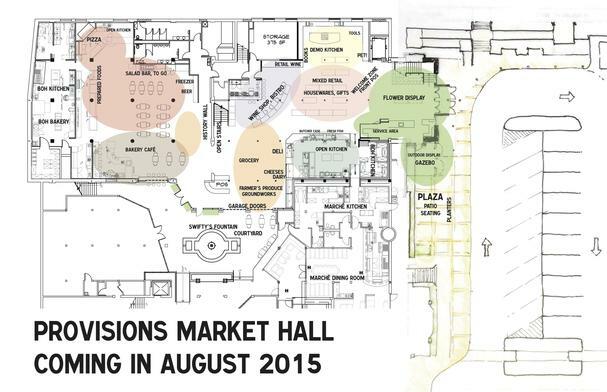 Provisions Market Hall will be the place where many culinary roads will meet. Much like Marché, the Market Hall will feature ingredients from the Oregon Coast and the range of family farms up and down the valley. Beer, cider and wine from the many craft breweries and wineries encircling the region will be abundant, both to enjoy at the table or to take home. The butcher shop and fish counter will offer local products that are responsibly raised and sourced from local farms and regional purveyors such as Long’s Meat Market, Laughing Stock Farm, Brandywine Fisheries, Taylor Shellfish and more. Provisions’ existing charcuterie and cheese program will be moved and expanded, and joined by a full-scale dairy case, grocery staples and an expanded specialty food section. The produce section will be a year-round farmers market, with marquee suppliers like Groundwork Organics offering the highest quality local fruits and vegetables. Customers will enjoy a whole new level of access to the ingredients that fill their plates at Marché and Provisions, now in fresh form to take home and share with friends and family. Opening up all aspects of Marché to the public, the Market Hall will showcase the very best wares from a restaurant kitchen perspective. The carefully curated selection of pro tools, classic cookware, elegant tabletop linens and decorative gifts will celebrate quality of life with beautiful, useful products and ingredients. From Mauviel copper pots to Wüsthof knives, Peugeot pepper mills, hand-selected French linens and classic Staub Dutch ovens, customers will find items not only cook with, but to add to their kitchens and lives–cutting through the clutter of many kitchen and home stores with quality, timeless products at a range of price points. Top of the line items will share the shelves with affordable classics and simple commercial-style implements. The goods and ingredients will be carefully chosen by Kimmel and her team­–the result will be an expression of a lifestyle rooted in quality, informed by the professional kitchen and truly one-of-a-kind. 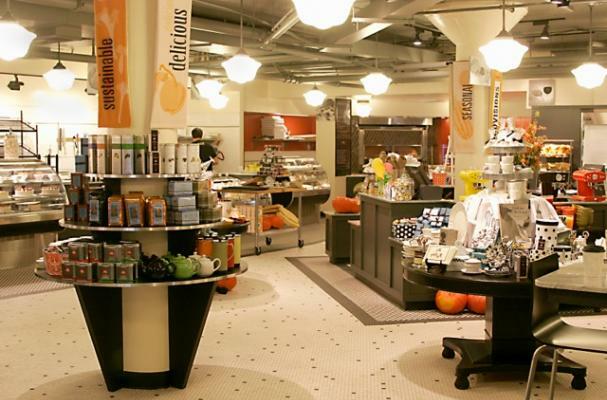 Marché provides a unique lens and culinary think tank with which to approach the increasingly popular food hall concept. Kimmel has been recognized as a pioneer in the food movement and the restaurant industry, having been a shepherd for local, seasonal food since the 1970s and a mentor to some of the region’s best chefs. Her decades of championing local food, coupled with the opportunity to return the 5th Street Public Market to its rightful place as a food market is a serendipitous one. The 5th Street Public Market is an historic building that originally served as a poultry plant and later an eclectic group of local businesses—many focused on food—from the 1970s and up to now. It has evolved into a beloved collection of eateries and shops, and is one of the region’s premier shopping destinations and gathering places. Much like the Ferry Plaza Building in San Francisco and the Pike Place Market in Seattle, the spirit of the a public marketplace will thrive in this historic setting. Marché and Marché Provisions will remain open during construction of the market, which will begin in May. Marché is an acclaimed restaurant that is about celebrating life and the bountiful Pacific Northwest with locally grown and gathered food, prepared with care and served in a lively and elegant atmosphere. Opened in 1998 by Chef Stephanie Pearl Kimmel, the restaurant takes its name from the French word for market – a word that describes not only its location in Eugene, Oregon’s bustling 5th Street Market, but also its philosophy of cooking. The menu is based on the foods one would find at a farmers market – fresh, seasonal, and regional – prepared with French technique, intensely flavored, simply and beautifully presented. The Marché team is committed to using only those ingredients that are at their best, and the menu evolves with the seasons of the year. Marché is located at 296 East Fifth Avenue, Eugene, Oregon. Follow Marché on Twitter, Instagram, and Facebook.